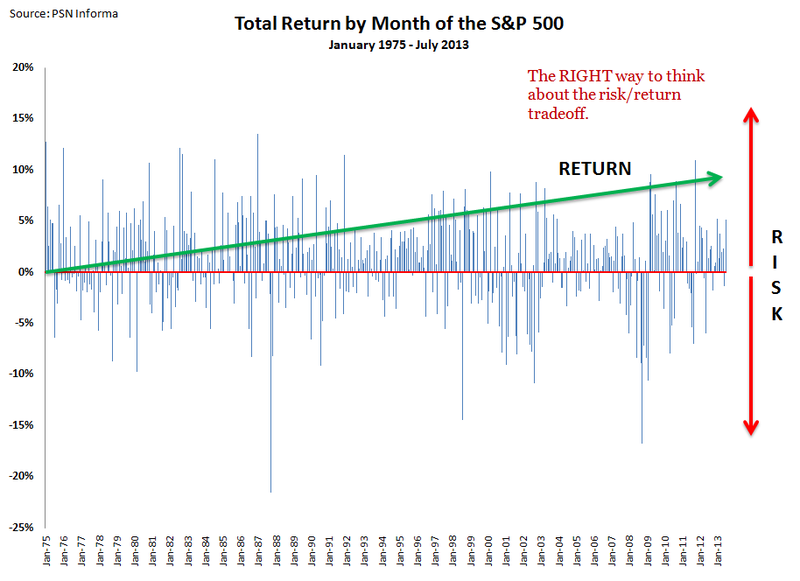 People generally understand the concept of a trade off between risk/return, but their understanding of this relationship is not always technically correct. The true nature of this relationship can be more nuanced than our intuitive feel for it allows. 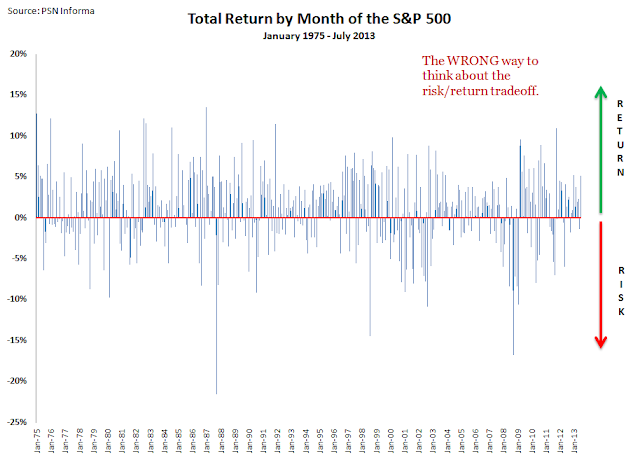 Here is an example of an incorrect way to conceive of risk/return and the appropriate alternative. All three charts are using the same data set, total return of the S&P 500 by month going back to 1975. In the first case we see how people commonly are led astray when conceiving of this relationship. It is not fully correct to simply think that "return" is what you gain when you gain and "risk" is what you lose when you lose. 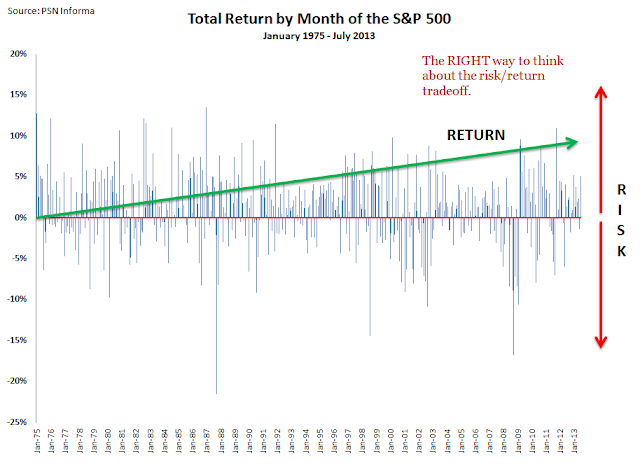 More appropriately, risk is volatility, deviation from the trend both up and down. Fortunately, the trend is biased upward in the case of the S&P 500 (at least historically and probably in the future). This bias is because upward risk (call this positive volatility) tends to be greater than downward risk (call this negative volatility). Because of this bias and the fact that the S&P 500 tends to outperform many other capital assets, we are encouraged to get exposure to the S&P 500 when we otherwise wouldn't have any. As an added advantage exposure to the S&P 500 comes at a relatively low cost, but that is a little outside of the scope of this blog post. PS. 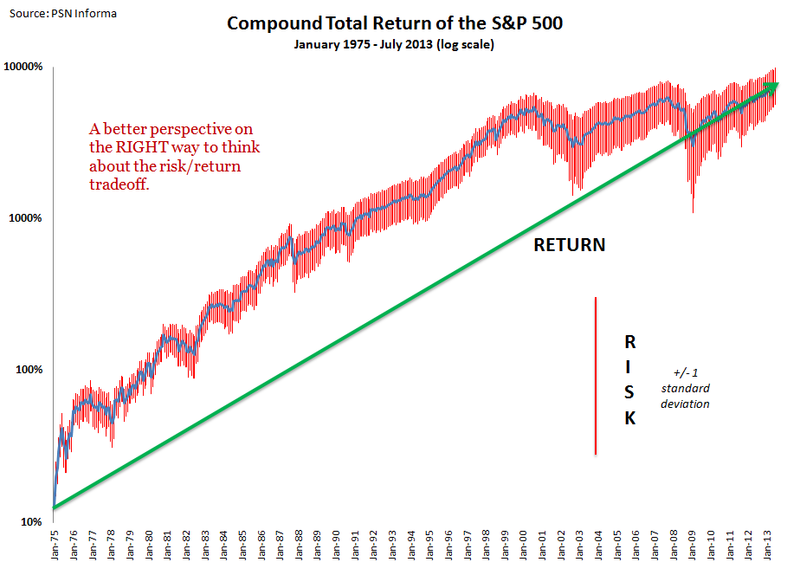 Note that in the last chart the risk in red depicts the range of one standard deviation of total return above and below actual total return. One standard deviation will tend to capture about 67% of historical volatility. Two standard deviations reflects about 95% of historical volatility. Because we are adding one full standard deviation to return and subtracting one full standard deviation from return, we are depicting in the chart 95% of historic volatility.